The Academic Technology Center has many learning opportunities available! Most workshops and trainings are instructor-led, so please pre-register by clicking on the links and plan to stay for the duration. Occasionally we will hold drop-in workshops, this will be noted in the description. Interested in a one-on-one session? Email atc-ttl@wpi.edu to request a training. Canvas’ redesign of Gradebook is going live this Summer, are you ready? Your Technology for Teaching and Learning (TTL) team is here to help you prepare for the first major change to Canvas’ functionality since we adopted Canvas in 2016. Co-sponsored by the NERCOMP Canvas Community of Practice, our inaugural New Gradebook workshop is happening on May 7th. Canvas Day, is a 1/2 day session where we invited all-around Canvas guru and Instructure employee Carrie Saarinen, to discuss the ins and outs of the new tool. There will be time at the end for Q&A and opportunities to discuss best practices or network with your fellow Canvas colleagues. 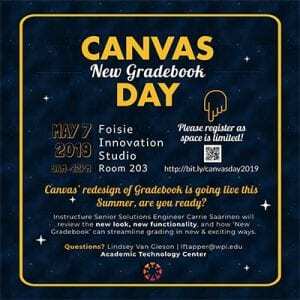 Register for the Canvas Day workshop. Don’t be left in the dark! Come explore with us how ‘New Gradebook’ can streamline your grading and communication with students in new and exciting ways. If you have any questions or concerns, please contact atc-ttl@wpi.edu. 3rd Annual Canvas Camp: What’s New in Canvas? 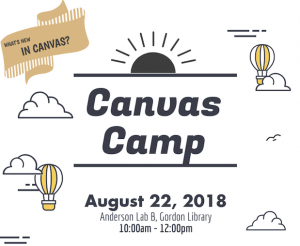 Canvas Camp is a drop-in style completely hands-on workshop where faculty will get to experience some of the new features released in Canvas the past year. We’ll have quick tasks set up (5-10 min each) for faculty to try out and experts on hand to help with any questions that come up. Open Hands on Workshop – Come build your course site under supervision of Canvas experts. Learn tips and tricks while you’re in the thick of it. Ask questions, get answers, pick up cheat sheets. Come stop by one of our Canvas Clinic workshops to get help- whether your site needs immediate triaging, or just a consult, the ATC is here to help! ATC is holding open workshops to help you get prepared for the term. We’ll have staff on-call for your Canvas design questions, tech support, or just reassurance or feedback. No appointments necessary, walk-ins welcome. Whether you just want a place to work without interruption, or need a total site overhaul, drop by during one of the following times! 1 hour advanced session led by Lindsey Van Gieson. This session will discuss module development and customizations, navigation, and how to optimize your course flow and organization! If you do not know how to do the above tasks, please sign up for our Basic Canvas Training session (or contact the ATC) before attending this session. 1/2 day summer camp activities led by members of the TTL team. Sessions are small group setting, registration capped at 6 participants per session (with 6 individual sessions available throughout the day!). > Faculty Showcase – See some real WPI faculty course sites built out in Canvas! *Each day will include a “Free Choice” activity at 4pm- drop in on a session you missed, or just hang out by the snack table! View the recording of Erin’s April 4th presentation.